Teaching your kids positive dental care habits is an important part of parenthood, and it's a daily job. However, it doesn't have to be a daily struggle. Follow these do's and don'ts to teach your kids healthy dental habits that they can enjoy now and in the future. When oral health care is a joy, kids are more likely to take great care of their teeth well into adulthood. Be playful in how you teach your children how to take great care of their teeth and gums. Kids are more likely to be engaged with learning optimal dental care when you make it feel like a game. Children should be brushing their teeth at least twice each day, and they should brush for at least two minutes every time. You may make the two minutes of brushing time go by quickly for kids by singing a silly song as they brush. You can make up your own song or try to redo lyrics to the birthday song, which lasts around two minutes. You may try singing something along the lines of "Happy brushing to you. Happy brushing to you. Brush your teeth and not your feet. Happy brushing to you." You can try switching up lyrics to make your kids laugh at a fresh joke as they brush. It can be easy for any exasperated parent to want to talk about the scary dental procedures that kids may need if they refuse to brush their teeth. However, take a minute to calm down before dealing with children when they won't cooperate with proper dental care. If you instill fear about potential procedures, that can result in an overall fear of the dentist which could make things more challenging. Instead of resorting to threats, focus on giving your children positive reinforcement. Praise them for a job well done when they cooperate with optimal oral health care habits. Try to catch your kids doing the right thing and heap compliments on them for doing so. You may even offer them a small reward such as a sticker when they finish their dental maintenance for the night. Oral care products for kids have a greater value than the gimmicky nature of items with your children's favorite cartoon characters. 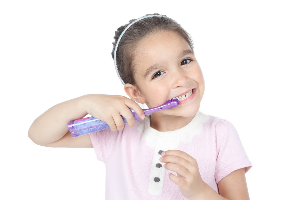 It's important to choose dental care products designed for little mouths. For one thing, smaller brush heads can make it easier for kids to reach all their teeth and do a more thorough job of cleaning them. Toothpaste that comes in child-friendly flavors can help kids look forward to nightly brushing, and that can result in more brushing and less complaining. That's a win-win for parents and kids. Toothpastes and mouthwashes that are created for children are more likely to encourage children to see dental care as a fun and positive thing. It's important to never lose sight of the fact that you set the tone for how your children approach their own oral health care. Don't slack on your own dental care habits. Model good habits yourself and talk to your kids about how important dental care is to you. When you're trying to teach your youngest children to brush their teeth, you may struggle to reinforce positive dental habits that older kids may have a hard time with. By setting a good example of how all your children should be brushing their teeth, flossing, and swishing with mouthwash, you can overcome negative examples by siblings. One important part of dental care that does not get enough attention is your diet. The condition of your teeth can rely heavily on what you eat, and that can be especially true for young children. If your children are not eating a balanced diet, their teeth may pay the price. They need to eat a diet that's rich in fruits and vegetables.